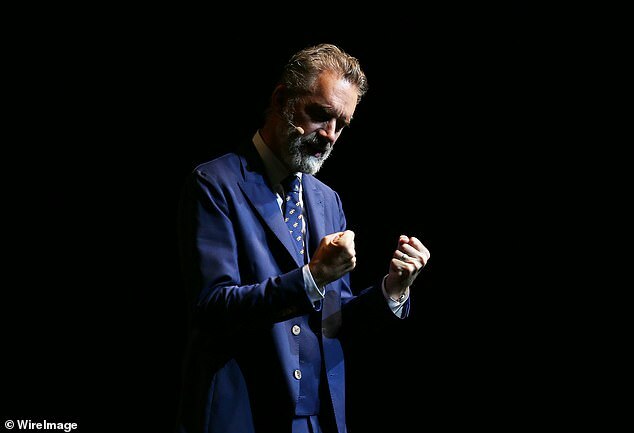 Jordan Peterson, the right-wing academic who has called himself the ‘professor against political correctness’ has called Cambridge academics ‘cowards and mountebanks’ after they withdrew an offer of a visiting fellowship. 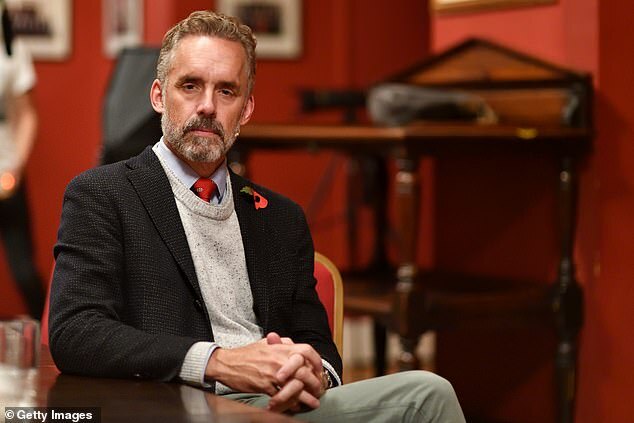 Dr Peterson, 56, a professor of psychology at the University of Toronto, had initially been set to teach with Cambridge’s Faculty of Divinity for two months in autumn. But on Wednesday the university took the invite back ‘after a review’. 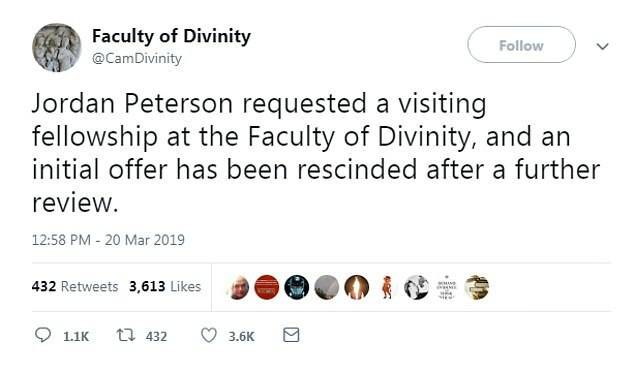 In a strongly worded response, Dr Peterson said: ‘I think the Faculty of Divinity made a serious error of judgement in rescinding their offer to me. ‘I think they handled publicizing the rescindment in a manner that could hardly have been more narcissistic, self-congratulatory and devious. ‘I believe that the parties in question don’t give a damn about the perilous decline of Christianity, and I presume in any case that they regard that faith, in their propaganda-addled souls, as the ultimate manifestation of the oppressive Western patriarchy, despite their hypothetical allegiance to their own discipline. Colleagues and fellow-travellers came to his defence. 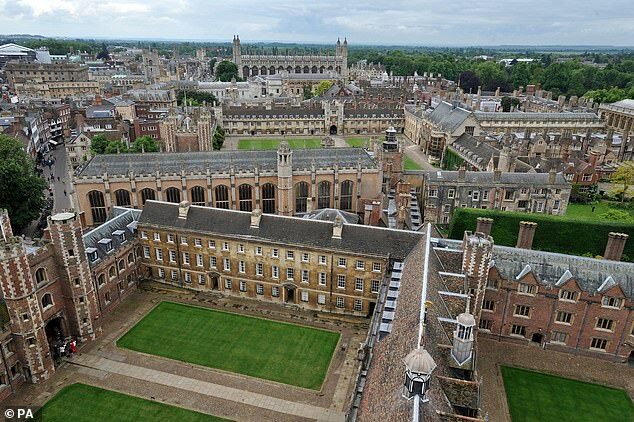 Toby Young, the journalist and educationalist, said he was ‘ashamed to be a Cambridge alumnus’. Professor Peterson wrote that had planned to write lectures on the Bible stories contained in Exodus while at Cambridge, after a lecture he gave while there last year, on the first sentence of Genesis, garnered 3.7 million views making it the most well-received talk he has ever posted online. He said: ‘I thought that I could extend my knowledge of the relevant stories … and that doing so would be useful for me, for faculty members who might be interested in speaking with me, and to the students. Dr Peterson, holdd controversial views on race, gender and political correctness. In 2016 he opposed an anti-discrimination law which would require him to use the preferred pronouns of his students and colleagues. He claimed it infringed on free speech, although he added he would use whatever pronouns a person wanted out of courtesy. 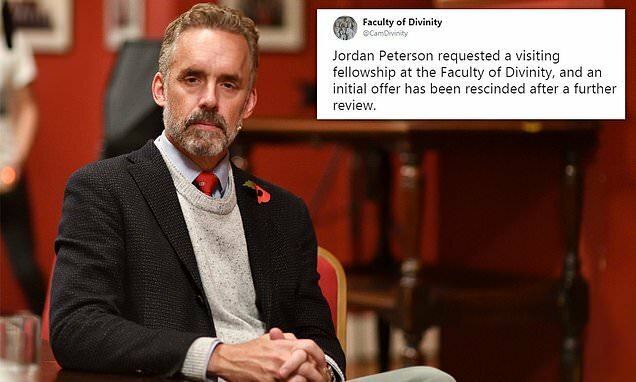 The students’ union said: ‘We are relieved to hear that Jordan Peterson’s request for a visiting fellowship to Cambridge’s faculty of divinity has been rescinded following further review.